All Executive and Project Category Awards Announced at ISE® North America Leadership Summit and Awards Gala on Nov. 8-9, 2018. ATLANTA, October 16, 2018	(Newswire.com) - T.E.N., a technology and information security executive networking and relationship-marketing firm, announced today the nominees vying for the 2018 Information Security Executive® and Project of the Year Awards for North America. Executives include top-ranking decision makers representing organizations in the academic and public sectors, commercial, financial services, and health care. Projects include large-scale technology endeavors that address key issues in the information security industry. Tomás Maldonado, CISO, International Flavors & Fragrances Inc.
James Quadarella, Managing Director, Head of Cybersecurity Operating Office, MUFG Union Bank N.A. HMS, Security Risk Management & Assurance Program – Bringing it all Together! The ISE® North America Awards recognize executives and projects, which have made a positive impact on their organizations through risk management, data-asset protection, regulatory compliance, privacy, and information security. Nominations are sent to T.E.N.’s distinguished panel of ISE® judges for review and scoring. 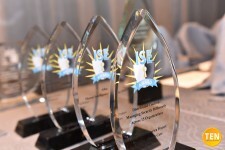 All nominees will be recognized at the ISE® North America Leadership Summit and Awards on Nov. 8-9, 2018 at the Summit Chicago and Hyatt Regency Chicago in Chicago, Illinois. Event attendees can earn up to 9 CPEs for participating in the two-day leadership summit, which will offer dynamic presentations and engaging roundtable discussions—led by ISE® Alumni—highlighting a spectrum of the industry’s most critical issues and innovative best practices. Finalists and winners are announced at the awards gala that evening and recognized through press coverage and inclusion on the T.E.N. website. T.E.N., a national technology and security executive marketing and networking organization, facilitates peer-to-peer relationships between top executives, industry visionaries and solutions providers in the cybersecurity industry. Nominated for numerous industry awards, T.E.N.’s executive leadership programs enable information exchange, collaboration and decision-making opportunities for Information Security Executives and cybersecurity solution providers alike. Its flagship program, the nationally-acclaimed Information Security Executive® (ISE®) of the Year Program Series and Awards, is North America’s largest leadership recognition and networking program for security professionals. T.E.N. delivers ISE® Private Dinners across 44 major cities throughout the U.S. and Canada to create even more opportunities for Information Security Executives, professionals and security solution providers to Connect, Collaborate, and Celebrate.